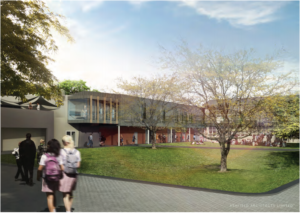 In April 2016, a team led by Athfield Architects was appointed to redevelop Cashmere High School as part of the Ministry of Education’s Christchurch Schools Rebuild Programme. 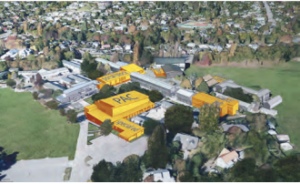 The scope of this redevelopment includes remediation of earthquake damage and weather tightness issues, repair of underground infrastructure and an upgrade of the school’s teaching facilities to meet the current and future needs of Cashmere High School. Since this time, Athfield Architects has been working closely with CHS staff and students to develop a concept for the redevelopment of the school. These designs are being developed in conjunction with a team of highly experienced local consultants including; Holmes Consulting (structural and civil engineers), Beca (mechanical, electrical and fire engineers), Geotech Consulting (geo-tech engineer), AES (acoustic engineer) and Aecom (quantity surveying). A large part of the school redevelopment will focus on rebuilding and refurbishing the school’s teaching facilities. This includes the construction of two large new teaching blocks with accommodation for the Science, Arts and English Faculties. These blocks – the Science Hub and the Portal Block – are being designed specifically with current and future teaching in mind. The proposed new Portal Block from across the Sacred Lawn. 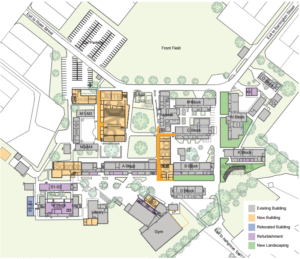 The block will replace the existing B-Block Art classrooms and will link together A & B Blocks (right) and the Admin Block (left). The block will contain new Visual Arts teaching spaces on the ground floor and new English teaching spaces and a shared staff workroom on the first floor. Arts teaching spaces on the ground floor and new English teaching spaces and a shared staff workroom on the first floor. In addition, the existing teaching blocks built mostly between the 1950-70s will be selectively upgraded to improve their operation allow them to support modern teaching methods. The extent of refurbishment will depend on final budgets but it is intended that A, B, D, K and S Blocks are all refurbished in some form. 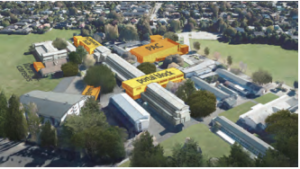 As part of the campus redevelopment, a new Performing Arts Centre (PAC) is proposed to replace the current PAC which is leaking and not fit for purpose. This will contain an 800-seat auditorium (large enough to seat two-year groups), two drama teaching spaces, music practice and rehearsal spaces and an auditorium foyer which will double as breakout spaces when the auditorium is not in use. 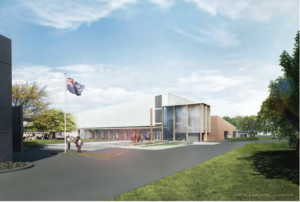 The auditorium will be a similar scale to Burnside High School’s Aurora Centre and will provide an asset not just for Cashmere High School but for the wider South Christchurch community. The venue is being designed as a multi-purpose space accommodating anything from school assemblies and prize givings to concerts and productions. The proposed new PAC from the front Field Admin Block on left). The building will form a new face to the school and open onto a new ātea space in front of the Sacred Lawn. Aerial view of the proposed redevelopment from above the Rose Street entrance with the new PAC being constructed in place of the current PAC. Adjacent to this a new Special Education Block will be constructed.